It’s almost that time of year again, back to school! Kids go back to learning and playing, and it’s important to provide them with lunches that are healthy and delicious. 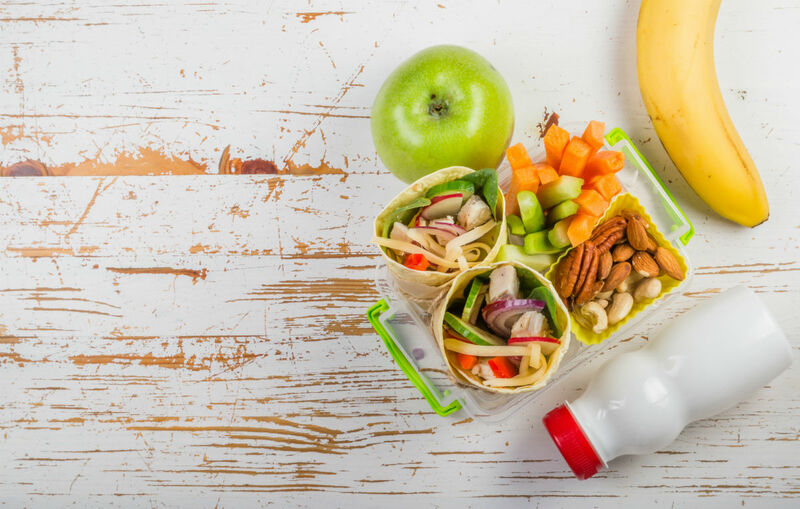 Getting your kids involved in the packing process can encourage them to make healthy choices, identify nutritious foods, and they’ll be more likely to eat a lunch that they helped pack. Parents can use these ideas for their lunches as well! Sandwiches are great staples but can get a bit boring. Instead, try adding your favourite filling in a whole wheat pita or wrap. Try wrap fillings like: salmon or tuna salad, chicken, lettuce and cheese, hummus and veggies. Cutting up larger pieces of fruit like apples, oranges and pears make eating fruit easier. Pair fruit slices with peanut butter to make them extra tasty. Kids love bite-sized foods and these mini meatloaves are full of protein. They are sure to be a family favourite! In a large bowl, combine the egg, milk, cheese, oats and salt. Add the ground beef or turkey, mix well. Form the mixture into eight miniature meatloaves and place these in a lightly greased muffin tin. Bake, uncovered, at 350 degrees F (175 degrees C) for 35 minutes. Salad can sometimes be boring or high in fat due to too much salad dressing. Instead, try an oil-based dressing and use ingredients that are high in fibre and protein. Choose a lettuce, favourite protein and then add nuts, seeds or fruit. Take a whole wheat tortilla and layer on chicken or turkey, lettuce and cheddar cheese. Then, roll and slice into small wheels. This lunch is tasty, healthy and fun to eat! Canned soup is very high in salt and not very filling, so try making your own! This hamburger soup is very hearty and low in salt. Pack soup in a thermos mug or a sealable Tupperware container. Heat up in the microwave and serve. This is a fresh and easy take on a classic that has less fat and is packed with veggies. This dish is customizable to your child’s preferences; add any vegetable and protein and mix! Mix all ingredients together, chill and serve! Instead of chips or fries as a side with your kid’s main meal, pack celery sticks and dip or cheese and crackers. These choices will keep your kids fuller for longer. Instead of candy and chocolate, add fruit and yogurt for a better choice that’s still sweet. Putting a portion of dinner in a container for lunch is a great time saver! Talking with your kids about what foods are healthier choices and discussing what foods they like can lead to your kids making better, healthier food choices. Happy Lunching!